Trophy bucks don’t get big and mature by being dumb. But believe it or not, the old saying “The bigger they are, the harder they fall,” can be true when it comes to big, aggressive bucks just before and during the rut. It may not actually have anything to do with their physical size, as much as it has to do with the size of their ego. Ever seen a buck with their back hair raised up, ears laid back and walking stiff-legged? These “tough guys” might think they own the place, the fact is they might be some of the most vulnerable and easy to take this hunting season. Why? For starters, they often cover quite a bit more ground than other bucks. They are constantly trying to defend an entire area by pushing off competitors. The more mobile they are, the more likely they will cross your path during hunting hours. During the weeks leading up to the rut, they will often visit scrapes several times a day to make sure others know that this is “their territory.” This will allow you to get a pattern on them for a short amount of time, which is better than nothing. What I like most about hunting aggressive bucks is their susceptibility to responding to calls, scents and decoys. Sometimes sitting in the stand for hours on end with no action can get boring, I’m not afraid to admit that. It’s kind of like fishing, I’d rather fish a stream or river where I’m constantly thinking and reading the water, than a lake where I cast out , set the rod down and wait. When you have an aggressive buck in the area, the odds of getting him to you with one of the three techniques mentioned above are really good. Calling during this time of the year is one of my favorite things to do. From rattling to snort-wheezing, deep buck roars to soft tending grunts, the art of calling deer is one I appreciate. I often find that these types of bucks respond best to intense fighting sequences when at long ranges, and snort-wheeze or buck roar (growl) when closer. Because they are an aggressive buck, light tickling of antlers or tending grunts might not be enough to convince them. Almost every deer hunter carries around a bottle of doe-in-estrous lure during the rut. But how many of you carry around dominant-buck lure? As surprising as it may be, trying to lure a buck in with a dominant-buck lure can be easier than using doe pee. How is this possible? 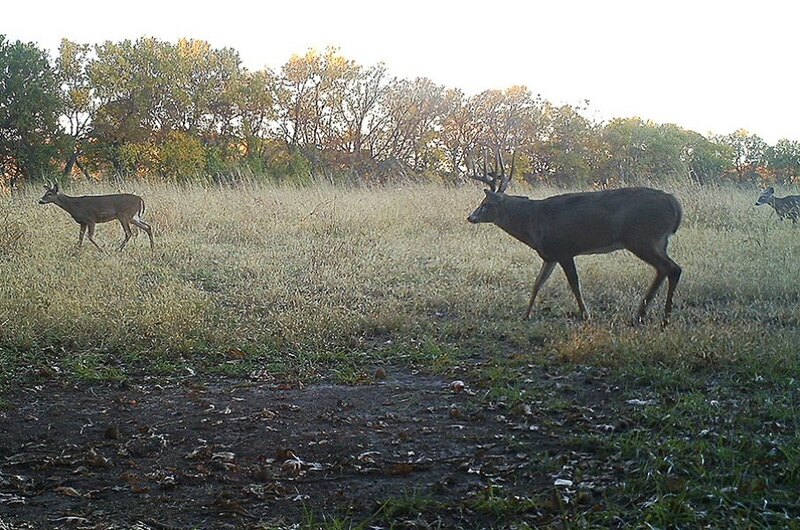 Take a buck that may be tending a hot doe. The odds of him leaving, a doe he has already secured to look for another, is slim to none. But if he catches wind of another dominant buck in the area trying to creep in and steal his girl, then the game just changed. I will typically use a doe-in-estrous lure the week or two leading up to peak rut to mimic an early available doe. Once several does in the area have come into estrous, I’ll strictly use dominant-buck urine in order to try and challenge bucks in the area. It seems to work pretty well. 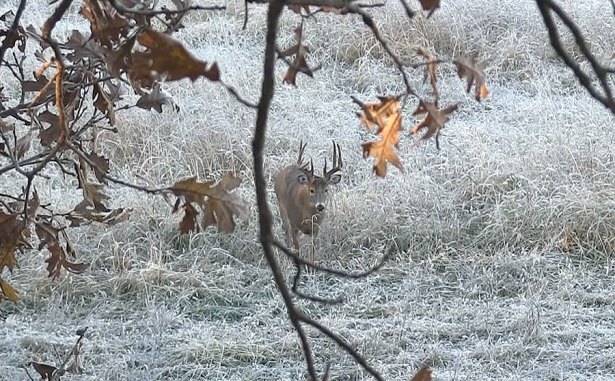 One of the most underutilized tools for hunting aggressive bucks are decoys. Obviously, you need to check your local hunting regulations first to see if you are able to use decoys. If you are, then placing them up wind and within bow range can be an excellent strategy. In wide open country, like Kansas, having a visual buck decoy is much like using a decoy during spring turkey season. Its job is to catch their attention and draw them in, allowing you to worry about nothing other than making the shot when the time comes. After a rattling or grunting sequence, a buck expects to see the challenger nearby, and will pinpoint the source of the sound with amazing accuracy. 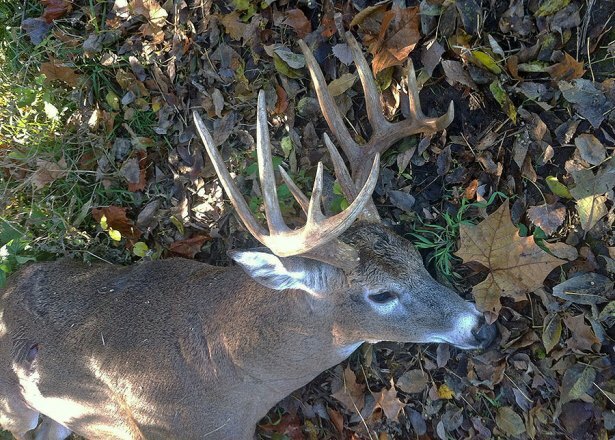 Having a decoy can seal the deal on an aggressive big buck. This fall, if you are hunting in an area where you know there is an aggressive big, take a shot at using calls, scents/lures and even a decoy. You might be surprised with the response you get. Check out NEW episodes of the Bone Collector every week exclusively on Outdoor Channel: Tuesday 5:30PM ET, Saturday 12:30AM ET, and Sunday 10:30PM ET!